Situated on the fifth floor of a residential building that dates back to 1819, the property is a remnant of Lisbon’s Pombaline period, an architectural style which emerged in the 18th century after the city experienced a major earthquake in 1755. The apartment called Lapa has been subtly revamped by locally-based Studio Gameiro to enhance its historical heritage while harmoniously introducing contemporary features. 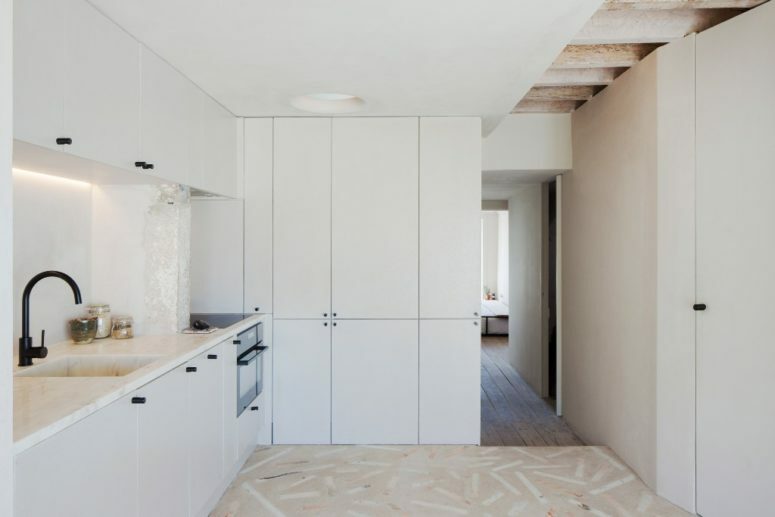 Aged frescos and exposed timber ceilings offset new floors and fixtures inside the Lisbon apartment. Divided into two separate zones, the apartment comprises of a private area that accommodates the bedrooms and a rear social area that plays host to living and dining rooms. The latter zone has new concrete flooring that’s inlaid with slim blocks of white, grey, and rosy pink marble. Arranged in what the studio describes as a “free, yet ordered” manner, the pieces of natural stone are intended as a reference to Mediterranean terraces, which are typically paved over with offcuts of marble. 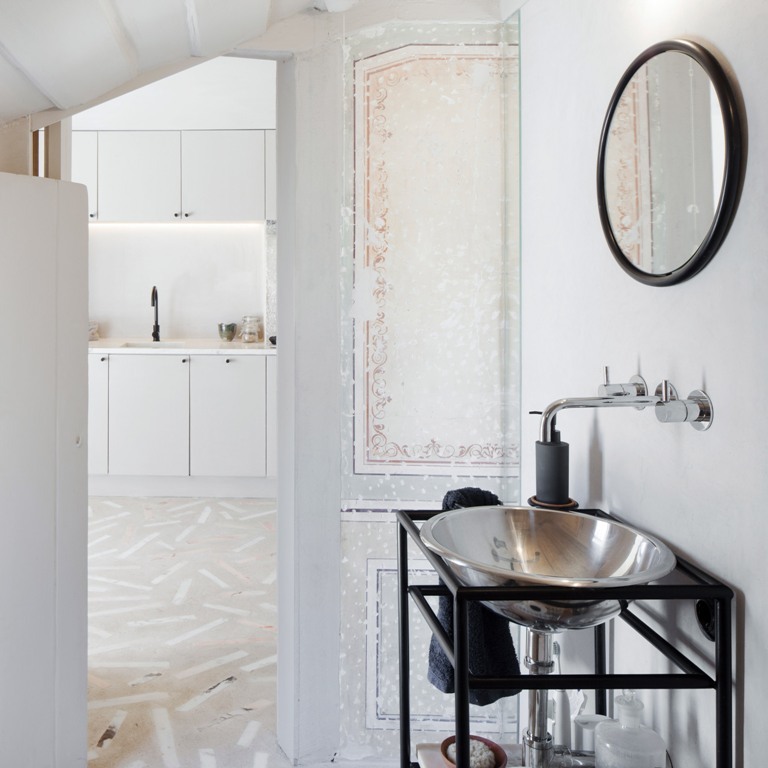 The pared-back aesthetic is featured the kitchen, which has been completed with pale cabinetry, and the bathroom, which has a simple metal sink basin and open shower. 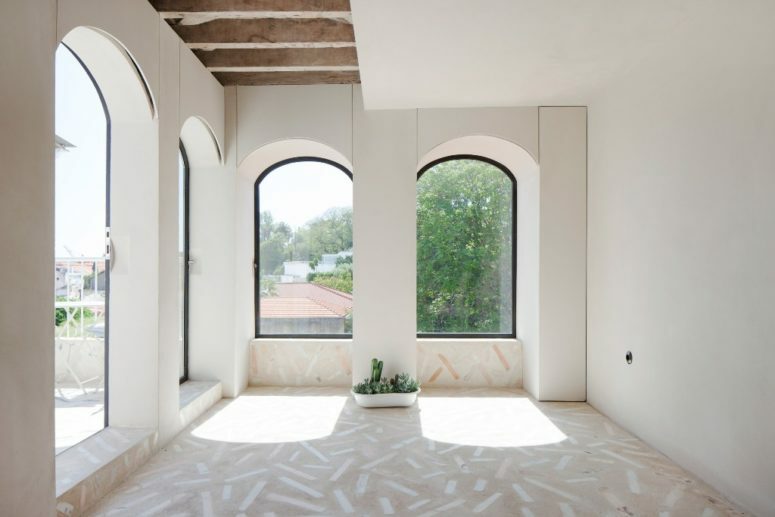 A series of arch-shaped glazed openings have been punctuated in the front elevation of the sitting room, to give views over the surrounding rooftops and access to a small outdoor balcony. 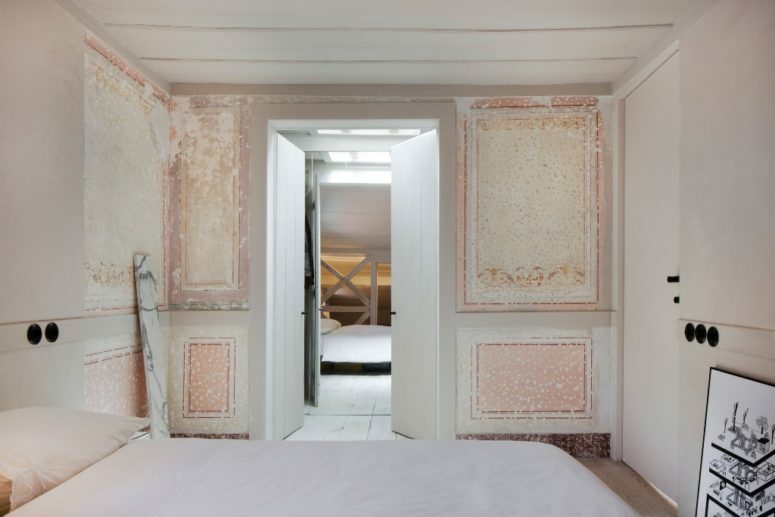 Ornately bordered frescos painted in the 19th-century have been preserved in the apartment’s trio of bedrooms, despite their now faded appearance. All three spaces also boast restored Riga pine floorboards that have been left untreated, matching the unfinished quality of the walls. 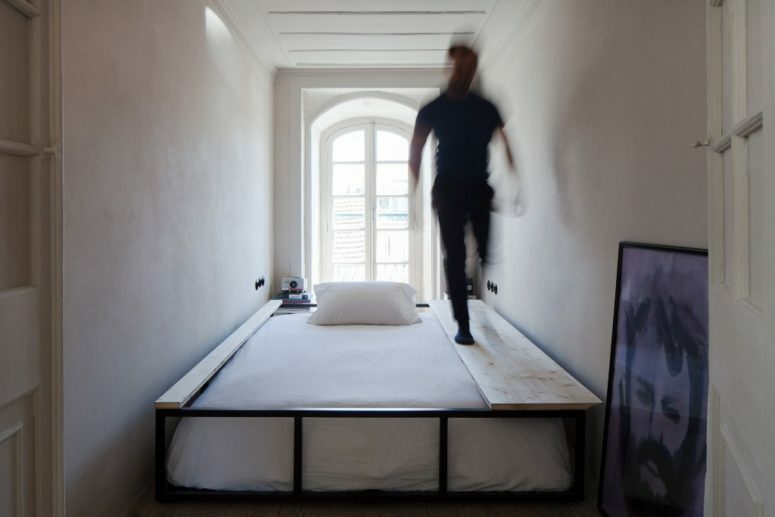 In the smaller bedroom the studio has crafted a bespoke double bed frame, which has a timber sideboard – this can be folded down to form a short walkway, which the inhabitant can use to reach the rear window and climb through to the balcony.